SavingStar.com Reviews - Legit or Scam? SavingStar.com Reviews – Legit or Scam? 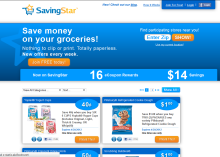 SavingStar.com is a new website/app that’s putting a unique twist on coupon grocery shopping in the digital age. The idea is to consolidate the source of coupons and allow shoppers easy access to offers without having to physically print out and carry around paper coupons. The company has been growing rapidly, quickly reaching over 1 million registered users and partnering with over 100 retail chains and countless brands to offer their users savings and a wide variety of shopping locations. So How Does SavingStar Work? The technology behind SavingStar.com is based on the founders eCoupon work at Upromise.com. First off and most importantly the service is free to use, all you have to do is logon to the site and create a profile. The next step is to register your grocery and retail store loyalty cards with SavingStar. This allows them to digitally link those cards with their coupon offers. Simply enter your zip code to see a list of participating stores in your area. Once you have registered your loyalty cards you’re ready to shop. Any eCoupon that you select from the site is automatically loaded onto the loyalty card so you don’t have to bring anything extra to the store with you. How do you Redeem Your Savings? It is important to note that your discounts will not show up instantly at the checkout counter or be visible on your receipt. Instead all your savings will be accumulated in your SavingStar account. This can take anywhere from 2-30 days. Once you reach five dollars in savings you can choose one several ways to cash out. Your options are a direct deposit into your bank account, PayPal, Amazon giftcard, or charity donation. Is SavingStar Right for You? If you’re someone who consistently uses coupons to save money at the grocery or drug store then this is definitely a service you can try out. There’s some setup involved in the beginning but once all your loyalty cards (i.e. CVS card) are registered the coupons link directly to those cards so you can save directly at the store with no paper coupons to worry about. You can also use their IPhone/Android app to activate eCoupons while you’re at the star which is helpful in case you’ve forgotten to do so ahead of time or have forgotten which coupons you’ve already selected. Does SavingStar Really Work ? Average Rating for " Does SavingStar Really Work " is 3.39 out of 5 based on 231 reviews. I cashed out over $238.00 to paypal days ago. No confirmation and money has not shown up in paypal, but was taken from my account. No response from savings star after contacting customer support many times. Next step Better Business Bureau. I am experiencing the same issues with Savingstar not giving credit for items purchased that clearly meet the criteria for the rebate. For example, I purchased 3 Pillsbury products at a Safeway (Tom Thumb) a month ago. I submitted the receipt and received the rebate. I clipped the offer again and made the same purchase a week ago but now I am being told that the Safeway store Tom Thumb does not participate in their program. Really? The issue today is the Dimetapp rebate (this rebate was also rejected on the Tom Thumb receipt a week ago). I just received a rejection that items purchased do not qualify although I scanned the Dimetapp in the store and the offer matched. The rejection email did not contain a copy of the receipt. I am losing money by being baited to purchase a product and then switched to the product not qualifying by Savingstar. Saving Star is not worth the hassles. They are always making up problems with submissions . I won't go into details, but it happens probably 50% of the time. I never have problems with Ibotta and Checkout51. Like dog and pony shows? Well, if you like jumping through hoops and over hurdles… waiting for a response that won't respond to your emails… then SavingStar is for you! I'm sorry to hear you ran into a problem. Please do write [email protected] if you've run into a problem, and our customer service team would be happy to assist you. It can take 1-2 business days (Monday-Friday) to hear back from our support team, though. I am having difficulty opening the app. It says access denied. I need some help. Please write to SavingStar customer support by emailing [email protected] and our customer service team will be happy to assist. I have issues now with Savingstar for not giving me my credit I activated the offer and purchase XYZAL and I also submitted a reciept. I was told I had to use my loyalty card. When I purchased the Xyzal from rite aid my loyalty card is linked with my phone number. I used my phone number for my plenti and purchased it. I was suppose to get a courtesy credit I never did. They decided not to give it to me after they told they would. I am very frustrated and I am thinking about closing my account. The app is easy to use and get money back for products I'm already buying. Great weekly deals. Helps me save a little every month. I started using rebate apps several months ago. Thus far, I've not had any issues with Ibotta, Checkout51, MobiSave or any of the others. SavingStar, on the other hand, is a non-stop problem. Most of their deals are a 'spend X amount' and 'get X amount back' type. So far, so good, right? The problem is, they will habitually only give you partial credit for what you've spent. For example, just this week I bought King Arthur products and Goya products. On the King Arthur receipt, SS initially gave me NO credit, even though I had spent the entire allowed amount. So I sent a message, waited and waited, and then saw that they gave me a credit, but only for PART of what I spent! All of my products are clearly marked on the receipt and everything is well within the criteria. I've now sent a second message and am waiting, yet again. Same receipt, and they've screwed it up TWICE. For the second receipt, I bought $9.88 in Goya products, but SS credited me with only $4.40. Again, the items are all marked clearly and the receipt qualifies, so now I am waiting on a response for that receipt also. Most of us that are bothering to use coupons and rebate apps decide to make purchases based on the deals we have available. I wouldn't have bought King Arthur or Goya products this week, but I did because I had a SS deal that said I would get X number of dollars back. I haven't gotten my credit, even after complaining. Either SS is fully staffed with inept adults that are functioning at a kindergarten level or it is just an absolute outright scam. Do not waste your time! Poor customer service! I started Ibotta and Saving Star at the same time. I have had 0 problems with Ibotta and am up to $47.75. Saving Star I am up to $2.50. I purchased $15.50 worth of Ortega products to receive a $4 cash back (I had to spend $15) I uploaded the receipt and they said I was like $4 away from what I needed. I sent a message to customer support and never heard back from them so I uploaded my receipt again and underlined the Ortega Products to show I had $15.50. Today I get a response saying the receipt I submitted did not qualify for savings because I had already submitted it before. Very dissatisfied with Saving star and they do not have very much to choose from. You can clearly tell that Josh did not read my complaint/review entirely. The SavingStar CS team *had responded* to my inquiry -- but did not resolve the matter. All Josh says is for me/us to wait for team to respond to emails. *SHAKES HEAD*. The same goes for these "human" responses by SavingStar on Reviewopedia. Stay away.… far far away in a different galaxy. I'm sorry to hear you experienced an issue. Our system automatically rejects receipts if they are submitted a second time. Please note that our customer service team responds to all emails. Currently they are responding to emails within about 4 business days and will be able to help you out when they process your email.